Barack Obama supports a provision in the spending bill before Congress that would allow Cuban-Americans to visit relatives on the island once a year and end limits on the sale of American food and medicines in Cuba. 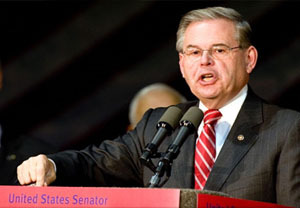 New Jersey Sen. Bob Menendez (D–Lunaticville) is so outraged by this that he’s threatening to oppose the entire bill. And he’s holding up two of Obama’s science nominations (John Holdren and Jane Lubchenco). And he’s threatening to hold his breath until his face turns blue. Jeebus. What is it about Cuba that drives people into decades-long fits of insanity? Even JFK, the guy who instituted the Cuba embargo in the first place, thought we were all kind of crazy on the subject. But 50 years later? Crazy doesn’t begin to describe it. What’s more, it’s a different kind of crazy from most exile communities. What accounts for it? A Cuban-American congressional candidate told me last year that the difference was simple: most Cuban exiles, when they fled the island after Castro’s takeover, left with their entire families. So for a lot of them, there’s literally nothing remaining there that they care about. You could drop a nuke on Havana and they’d be OK with that. This promotes a different brand of insanity than in most exile communities, which might hate the current regime in their home country but still have deep personal ties to it. I don’t know if that’s really the explanation or not. Comments welcome on this score. But there’s got to be something that explains this. It’s just nuts, and Menendez should be ashamed of himself. It’s time to grow up.